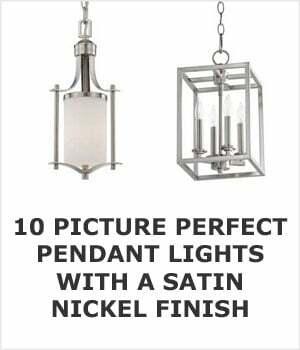 Satin nickel pendant light fixtures are a popular choice for many reasons. Like their similarly-named brushed nickel counterparts, they hide a multitude of sins, like fingerprints and dust, better than chrome or stainless steel. And they look amazing, too, which is why so many homeowners are opting for this practical finish. 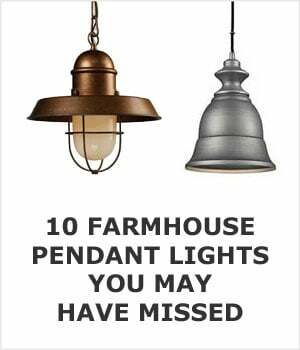 Here are 10 awesome fixtures to consider for your home. This fixture is a practical and attractive piece of lighting for your kitchen or dining room. Its’ finish gives just the right amount of shine but can be wiped down with a damp cloth for easy cleaning. The suspension pole has three segments for variable height and a glass diffuser beneath the bottom of the inverted bowl for gentle light. This foyer light is a blend of classic candelabra style mixed with a modern geometric twist. It features an adjustable chain and four candles for adequate ambient light. The pendant uses 60 watt incandescent bulbs, which provide just enough illumination for a modest foyer. The open cube design is sturdy, and the chain, which measures 96 inches, allows you to hang it at just the right height for your home’s ceiling. Manufactured by Quorum International. Here’s a direct link to their dealer locator page. This antique-looking fixture has ‘Old World’ charm that will transform any space. The satin finish complements the stainless steel that is in so many kitchens beautifully. Each light features a bell-shaped frosted glass diffuser shade and the pendant light can be used with a dimmer so you can adjust it up for tasks and dim it down when you only require a little ambiance in your kitchen. It houses 3-100 watt incandescent (E26) bulbs and features an adjustable hanging pole so you can get just the right height for your needs. Made and sold by Wayfair under the Trent Austin Design label. This very modern fixture was actually inspired by medieval iron chandeliers. Its design is simple–a thick, metal ring lined with LED’s that’s suspended by strong cable. The LED lights are bright but dimmable, allowing you to fully customize the brightness to your needs. It’s a fun, very modern take on a classic design and won’t be to everyone’s taste, but if you are looking for something that combines simple design with high-tech lighting, this may be for you. Here’s a link to the spec sheet and where you can pick it up online. Having trouble picking? This page may open your eyes to that perfect option that you have never even considered before. A classic prismatic shade and exposed hardware give this pendant light tons of character. It features vintage charm with modern capabilities and it’s perfect for your kitchen or office space. The mitered glass shade is suspended by an adjustable rod. 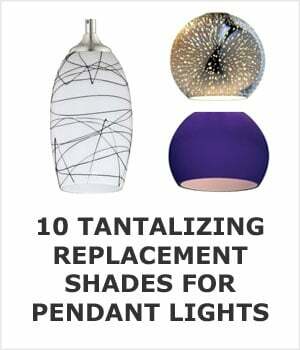 It comes in several sizes so you can either group several smaller ones over your counter or kitchen island, or you can use a singular, larger light in a smaller space. It can be used with a dimmer and takes one 72 watt halogen bulb. Made by Hudson Valley. When you want a simple, functional, attractive light? This mini pendant is perfect for the job. The satin finish on this alabaster bell gives it a chic look that’s versatile enough to fit into most decor styles. The simple design is unobtrusive and perfect for adding task light where it’s needed. Use one for localized lighting or group a few together over your kitchen island for a great look. This fixture uses 100 watt incandescent bulbs and can be used with a dimmer for a more versatile lighting option. Full specs here from the manufacturers website. 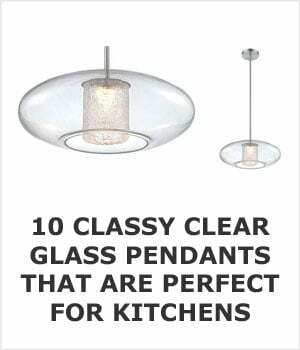 White glass gives this antique-looking pendant style and charm. The vintage look comes with an adjustable hanging rod and works well in groupings. 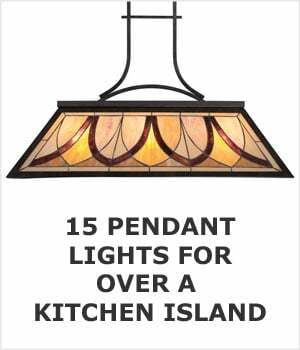 This is a great light to hang in multiples above your bar or kitchen island. Use it singularly to provide added task lighting over a kitchen sink or desk. It’s an attractive fixture that makes a great statement wherever you use it. It can be used with a dimmer and takes a 100 watt incandescent or LED bulb. Made and sold by Elk. Is clear glass more your style than this white one? There are lot’s of clear glass options at this link. This piece of high-end lighting may not be in everyone’s budget, but if you are looking for a statement piece, you may want to consider it. With 24 individual globed pendants, this nickel light fixture makes it appear as though you’ve captured a constellation of starlight in your home. Each globe is capped with a white glass dome and attached to an adjustable 10’ cord. It can be used with a separate ELV dimmer for even more versatility. Made by Sonneman. They have lot’s of different sizes and configurations so be check them out if 24 is too many lamps. This quirky pendant light features 3 ‘arms’ with a bulb attached to each one. The design is simple and extremely functional. The fixture is satin nickel with matte black fittings. Each 60 watt vintage filament bulb provides ample task lighting and it comes with two 6” and two 12” hanging rod segments for better adjustability. It’s a good transitional light that works as well in a living room as it would in your kitchen. This mini pendant has a look that’s part antique, part industrial chic. The satin nickel complements the white glass shade perfectly. A somewhat austere design, this chain-suspended fixture is perfect in multiples and creates a charming look when suspended over your home bar or kitchen island. 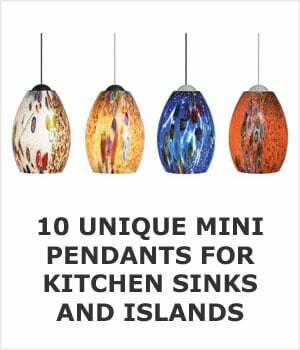 Are you specifically looking for a pendant light to hang over an island? We have 15 of them right here. It’s also a very versatile piece of lighting, using either LED, CFL, halogen, or incandescent 100 watt bulbs. 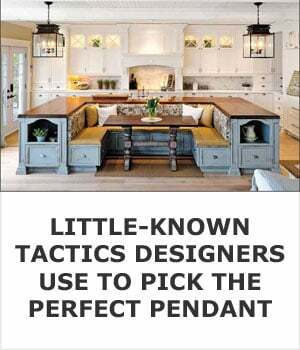 It doesn’t work with a dimmer, but it does work well with a number of decor styles and its 120-inch chain allows for plenty of adjustment to find the perfect hanging height. Not sold widely but available from Wayfair.